By YOSHIRIDER123 - And I don't like 'em. GameStop is a well-known videogame retailer found in the Americas. Despite its massive popularity, with it essentially having created a monopoly in the video game market, there exists a lot of criticism for the store that loves to give "Power to the Players". Countless times have I heard of anecdotes from GameStop consumers and personal acquaintances that its employees are very unknowledgeable, rude, and unprofessional. One of the biggest complaints about the store is regarding how GameStop endorses the selling of new copies of games when they may have actually been already been used by its employees. That's not just unethical, that's disgusting. While not quite on the same scale of infidelity, a recent development caught my attention that kind of bothers me. On the move to blasphemy! 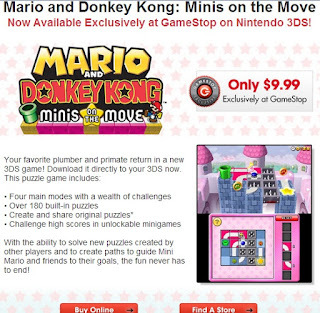 Now, Mario and Donkey Kong: Minis on the Move for Nintendo 3DS is a recently released game for the system. It's an experience not quite tailored for the brick and mortar stores, so it's offered at the low price of $9.99 via the Nintendo eShop, Nintendo's digital store for all downloadable content. The problem here isn't quite the fact that the game may be overpriced, or that the game may be poorly executed (as some reviewers like Joystiq have chimed), but rather that GameStop is sending a contradictory message to its market. 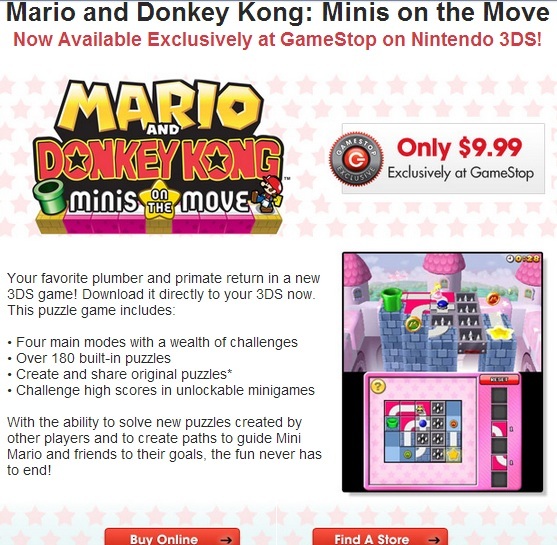 It says that the game is available "exclusively at GameStop". This isn't true at all, and GameStop knows it. They don't want poorly educated consumers to know that they don't have to give their money to GameStop. This is just another blatant attempt from GameStop to lie to its customers and squeeze out as much money as they possibly can, disregarding their "Power to the Players" motto. It's ridiculous and shameful, and makes me wish GameStop wasn't at the top of the market with these kinds of hogwash tactics. Do you feel the same way about GameStop, or have any other opinions about the retailer? Like what YR says? You can follow him, YoshiRider123, on Miiverse to get the latest on what he's playing on Wii U. His Nintendo Network ID is the same as here, so it's easy to remember! See Ludwig's related article here! I've been directly insulted AS A PERSON by GameStop. I was buying Pokemon Soulsilver, with the lugia action figure, the guide, everything. One of the employees at the desk said "You need a guide? That's retarded." and that makes me angry. Legitimately angry. GameStop needs to be watchful of who they employ. Something just like that happened with someone I know who went to pre-order Animal Crossing: New Leaf. Silly stuff. There are guides to Animal Crossing? Apparently, yeah. I think there are like two different ones for New Leaf, last time I checked. I know there is usage for like, a catalog list of all the items. But that seems like a waste of paper to print out.